When one thinks of Tonga in the South Pacific, the mind conjures up images of a Polynesian paradise: white sand beaches on lush tropical islands, sprinkled like emeralds on a turquoise sea. Now supplement that image with quiet anchorages, warm breezes, crystal-clear waters, and friendly people and it’s understandable why Tonga is considered one of the world’s premiere sailing destinations. Tonga’s remoteness, about 1300 nautical miles northeast of New Zealand, may be partly responsible for the islands retaining their unspoiled beauty and timeless character. For Canadians, it’s a long way off: 17 hours flying time from Vancouver on three different airlines. But it’s amazing how quickly travel fatigue is dissipated by the anticipation and excitement of visiting a new culture. 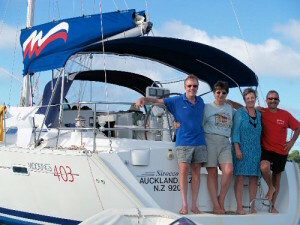 My wife Sandy and I, with our friends Barry and Joan, scheduled a bareboat sailing charter with The Moorings for two weeks in March. Our flight departed from Vancouver, via Los Angeles, to the main island of Tongatapu where we spent a few hours exploring the bustling capital city of Nuku’alofa. Its numerous small shops and markets interspersed with palaces and temples was a world away from life back home. Our one-hour flight on Real Tonga Airlines to the Vava’u Islands would take us even further back in time. After a restful night’s sleep at Boathouse Apartments overlooking Neiafu Harbour, we walk to The Moorings dock. Sirocco, a 41’ Beneteau gleaming in the sunshine, is awaiting our arrival. After stowing our gear, we receive a thorough boat and chart orientation; then take a short cab ride into downtown Neiafu to purchase provisions. The experience is enlightening — and most likely amusing to the locals. Following a visit to the ATM to obtain Tongan currency, we fill the trunk with items from several small grocery stores, a bakery, meat supplier, wine store, and an outdoor market. The sun is hot; the pace slow. We enjoy practicing the language and learning the currency, which initially involves holding out a handful of cash and allowing vendors to pick the correct amount! Vava’u is a cluster of 50 islands scattered across 15 miles of ocean, protected from swells by outlying reefs. The Moorings’ navigational chart of this area identifies 42 designated anchorages, half of which are approved for overnight in prevailing southeast winds. The area is small enough that one can sail from one end to the other in just a few hours. Yet, it’s impossible for us to see it all during our two weeks. However, we do manage to visit a few villages and more than a few deserted islands for beachcombing, snorkeling and replenishing our souls. Waves lap softly against our hull; a rooster crows; church bells ring. I peek through one eye at my watch. It’s 5 am. What? Who goes to church at five o’clock on a Sunday morning? In the village of Matamaka, everyone does – all 350 islanders, young and old, attend church at 5 am, again at 10 am, and then again at 4 pm. 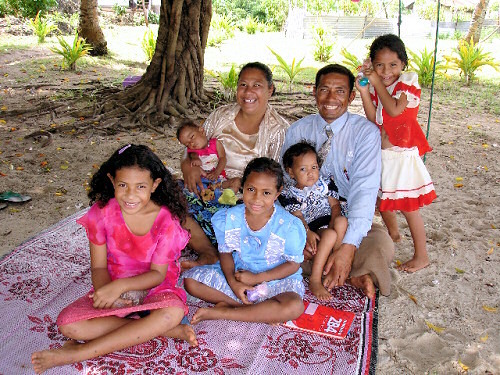 Religion is a very important part of Tongan culture. Anchored just off a crescent beach bordering the village, we tie our dinghy to a coconut tree and amble ashore to explore. Almost immediately, we receive a warm welcome from Fa’aki and her husband Ben, who live in a small house with their five young children. In very good English, they graciously offer to show us around. Six churches, a school, playground, Kava House and an array of small houses line the dirt path that meanders through the village. Only the churches and the Kava House have electricity; which means there are no refrigerators, stoves, washers or any other electrical conveniences that we Canadians take for granted. Domestic pigs, dogs, and chickens wander about; columns of smoke rise from outdoor cooking pits. Everyone we meet smiles shyly and says “hello” (“Malo e lelei”). Captain Cook, in 1777, called Tonga “The Friendly Isles” and it’s obvious why. We feel like we have been transported back a couple of centuries when people lived off the land and sea, bonding together to ensure survival. As we pass the Kava House, Barry asks: “What goes on in there?” Ben invites us into the small building occupied by a half-dozen men sitting in a circle on the matted floor. Kava is a brown, watery drink made from the dried roots of a pepper plant. It is widely used as a ceremonial drink throughout most of Polynesia. The Kava House serves as a meeting place, mostly for men. 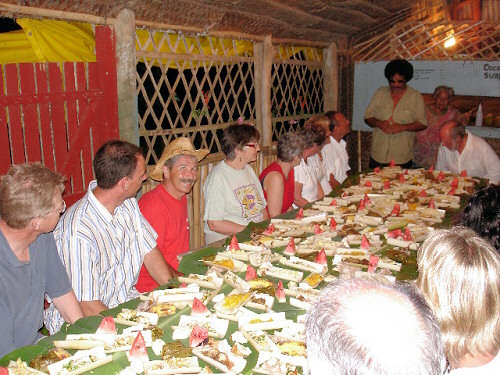 After introductions, we are offered half coconut shells as cups and invited to try it. We describe our first taste as bitter with a slight tingling of the lips and tongue. The men smile approvingly with stifled laughter. Apparently, after a few drinks, the effect is a feeling of calmness, which to Tongans represents renewal. After our drink, some conversation, laughter, and an awareness of the importance of this tradition in the daily lives of Tongans, we bid farewell and return to the boat. On the way, Ben and Fa’aki invite us for lunch and we agree, but only if they join us on board. They arrive in their small fishing boat with fresh mussels cooked in coconut milk, boiled tapioca root, and a mango-coconut cordial. We are extremely honoured by their generosity, sharing their meager food supplies with relative strangers. In return, we offer them a roll of aluminum foil, dry pasta, canned goods, a Canuk’s hat, and some lollipops and gifts for their children. After they leave, Joan and Sandy conspire to “adopt” this lovely family and immediately start planning a care package to be sent to them at Christmas. On the most western island of Hunga in front of Ika Lahi Lodge, we tie to a mooring buoy for $10 Tongan (about $6 Canadian). In anticipation of a visit to the village school the next morning, we gather up some school supplies and children’s toys we had brought with us. Our visit is delightful. The principal holds an impromptu recess and invites us inside. Later, we meet an elderly woman who proudly shows us her beautiful flower garden and then offers us a few mangos. She reluctantly accepts our handful of change. Tongans, we discover, are extremely generous, preferring to give rather than receive. During our chart briefing, we were advised about a centrally located Tongan Feast, which is attended by a dozen sailors from various countries. Guitars and drums accompany graceful young dancers, followed by an authentic meal of local foods. Conversation mostly involves things to see and do in the islands. Everyone has his or her favourite snorkeling reef or secluded sandy beach. One of our favourites is Maninita, a small island furthest south, designated as a bird sanctuary. Under sunny skies and brisk easterlies, we beam reach for a couple of hours with two other charter boats. Along the way, a school of Spinner dolphins play in our bow wave. Upon arrival, a serpentine turquoise path leads through a matrix of coral to a sheltered lagoon. Boobys, petrels, terns, and various other sea birds circle the forest canopy as we respectfully explore this special place blessed by nature. The shallow reefs are teeming with colourful fish; the beaches look and feel like granular sugar. Designated as a “day anchorage,” we reluctantly weigh anchor and retrace our route to picturesque Taunga Island, with its tidy little village in which a young man named Joel proudly shows us around, Alice gives us a bag of mangos, and Betty sells her handmade woven baskets from a panga (small boat). One of the more breathtaking experiences, literally, is Mariner’s Cave. The entrance to this submerged cave is 3 metres down, 4 metres horizontally beneath an overhanging rock, and another 3 meters up into a cavernous limestone grotto. Some local knowledge and commitment are required for this dive. Two fellow charterers, who had dove it last year, supply the local knowledge. Since there are no signs indicating the entrance, they dive first and don’t return, which means either that this is the right spot or they’re never coming back! I take a deep breath and commit — popping up inside with a desperate gasp for air. Standing on a ledge, our ears plug each time the misty air is compressed by the incoming one-metre swell. Going out is less intimidating as sunshine streams through the opening. Incidentally, you can practice for this feat by diving, with mask and flippers, underneath your sailboat’s keel from one side to the other. Nearby Swallow’s Cave is another popular natural feature, so named for the swallows that reside therein. 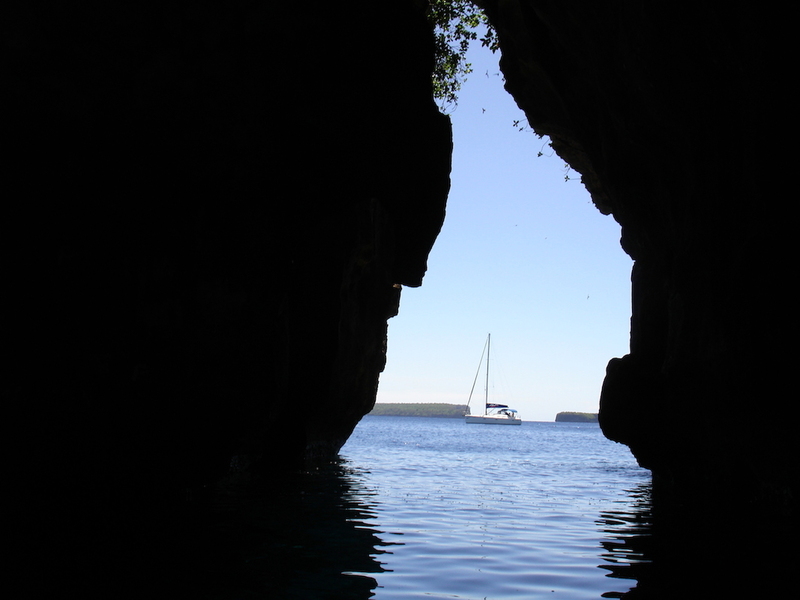 This large cavern at the waterline can be entered and explored by dinghy, which suits my non-committal crew just fine! Each morning on VHF Channel 26, sailors are provided with tide and weather information. 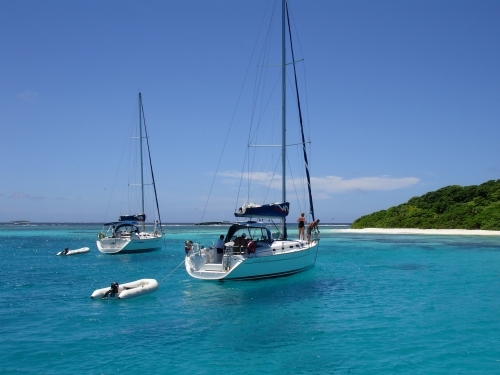 Most days we get a mixture of sun and cloud with 10- to 20-knot breezes providing comfortable sailing. On our last day, 30-knot “breezes” prompt a reefed jib and main. Charging back to The Moorings base, we’re totally pumped and at the same time saddened as we approach the end of our adventure. After lifting off the runway and gaining altitude, we peer out the window at our now familiar playground with the hope that this pristine paradise will always remain timeless and welcoming to future sailors. 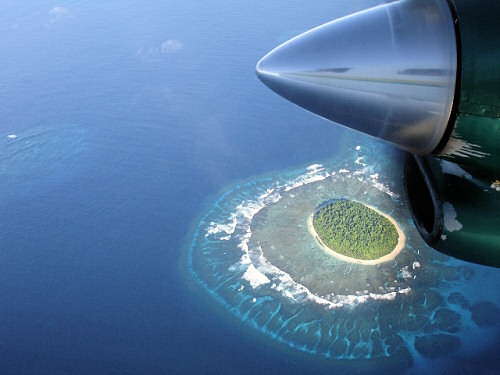 Real Tonga Airlines provides daily flights (except Sundays) from the main island of Tongatapu to the Vava’u Islands. They will also assist with accommodation and arrange tours within the Kingdom of Tonga. The Moorings charter base in Tonga offers bareboat and skippered sailing yachts, both mono-hulls and catamarans, ranging from 33 to 46 feet. Line-of-sight navigation, minimal tidal changes, and well-protected harbours make for the easiest cruising in the South Pacific. Plus, the Vava’u Islands are a breeding ground for humpback whales making them a common sight for sailors from July through September. This newly renovated apartment-style hotel, with Tongan ambience, is managed by The Moorings Yacht Charter operation in Vava’u. It is within walking distance of the Moorings base and Mango Cafe, just 200 metres to downtown Neiafu, and 15 minutes from the airport.